Rebecca & Mitch’s Winter Wedding! Great Gatsby Casino Themed Holiday Party! To see more pictures, please visit the Karen Brown New York Facebook page. Professional photographs by Charles David will be up soon. On October 6th I had the privilege of being part of Anne-Marie & Chris’s fairy tale wedding at the beautiful Church of St. Ignatius Loyola in Manhattan, and their breathtaking reception at Oheka Castle and Estate in Long Island. For their 5% donation they have chosen to give to the Discalced Carmelite Nuns of San Antonio, Texas. It’s another “Event that Gives Back!”. The Discalced Carmelites dedicate themselves to a life of prayer. The Carmelite nuns live in cloistered monasteries and follow a completely contemplative life. The heart of the Carmelite charism is prayer and contemplation. The quality of prayer determines the quality of the community life and the quality of the service which is offered to others. Prayer and contemplation for the Carmelite are not private matters between the individual and God but are to be shared with others since the charism is given for the whole world. Each day is marked by silence for prayer. In addition to the daily celebration of the full Liturgy of the Hours, two hours are set aside for uninterrupted silent prayer. Anne-Marie & Chris’s Fairytale Wedding! As you probably know by now, Karen Brown New York is passionate about giving back to the community in tangible ways and it is my hope to inspire others to give back as well. 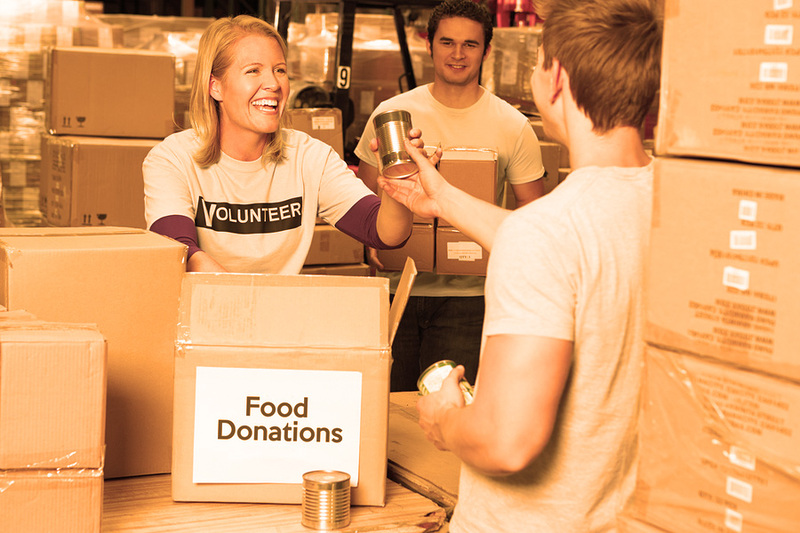 As we approach the Fall season many corporate offices and organizations will coordinate food drives and if you’re looking for creative ways to help end hunger, Berry Breeze has put together a list of 5 Ways You Can Help End Hunger in America. I am thrilled that one of our ideas was included! 5% Goes to God’s Love We Deliver! It was an exciting week for buyers at the New York Accessory Market and I loved working with Robert Rose, planning their rooftop cocktail party for client’s and industry friends on August 7! At the conclusion of their event, they chose God’s Love We Deliver for their 5% donation – another “Event that Gives Back!”. God’s Love We Deliver is the tri-state area’s leading provider of nutritious, individually-tailored meals to people who are too sick to shop or cook for themselves. Founded in 1985 when one woman began delivering food on her bicycle to a man dying from AIDS, God’s Love now cooks 4,600 meals each weekday, delivering them to clients living with life-altering illnesses in all five boroughs of New York City, Newark and Hudson County, New Jersey. All of our services are provided free of charge to our clients, their children and to the senior caregivers of our senior clients, without regard to income, and we have never maintained a waiting list. Because we believe the combination of hunger and serious illness is a crisis, we deliver food within 24 – 48 hours of first being contacted. God’s Love We Deliver is a non-sectarian organization, providing meals with the strong belief of “food as medicine.” To that end, we employ a team of registered dietitians who individually tailor meals to each client’s specific medical requirements. God’s Love provides all services by employing a small but dedicated professional staff and with the critical assistance of nearly 8,000 volunteers annually. I was excited when I got the call from Robert Rose, a jewelry line that has been featured on such celebrity driven shows as Wendy Williams, E! Entertainment, Project Runway, Entertainment Tonight and the Insider and often found in magazines such as InStyle, Elle, Glamour, Lucky, Essence, O Magazine and the Sports Illustrated Swimsuit Edition. The owners needed help planning a cocktail reception on their showroom’s rooftop terrace during the New York Accessories Market Week and I was thrilled to help! As luck would have it, the forecast showed rain for the night of the party and we had 48 hours to execute Plan B; tenting the terrace. The party was a huge success despite the weather, which in the end never really rained! Regardless of having the tent, there was still a great view of the Empire State building. Neuman’s did a fantastic job on the catering and the Milkbar cake was a hit! 74Events’ DJ, Duane, kept the party rock’n until the very end, finishing the night off with “We Are Family”, a tribute to the Robert Rose family. Jeanne & Andre’s Brooklyn Wedding! Sandwiched in-between rainy days, we could not have been more lucky with the weather on Saturday for my couple’s Brooklyn wedding at Greenpoint’s Transmitter Park with a reception following at the New York Distilling Company, also known as the Shanty. It was an honor for me to be the wedding planner for Andre, a firefighter with the FDNY and his now wife, Jeanne. The vision for the wedding reflected the couple perfectly, both liking the idea of keeping it casual but ensuring it was a fun party for everyone, and it was! The food was one of the highlights of the night. We had the Calexico food truck serving up tacos with chips and guacamole, and a chef cooking Indonesian style BBQ on site, both cuisines representing the heritage of the bride and groom. The Momofuku Milk Bar wedding cake was an absolute hit with everyone and for the last hour we had the MUD truck serving night caps. Being that the wedding was at the New York Distilling Company, guests received a small bottle of gin with personalized labels as their parting gift. It was truly a night to remember! To see more ‘behind the scenes’ pictures, please visit the Karen Brown New York Facebook page. Click here to see professional photographs by Laila Bahman.